For over 75 years, the Sechelt Volunteer Fire Department has been protecting the communities on the Sunshine Coast. In April 1945, when the Sechelt volunteers first undertook the protection of property from fire, World War II was still in progress, wartime rationing was still in effect, gravel roads were the norm throughout the Sunshine Coast, and the B.C. Power Commission took over the Columbia Power Co. The first issue of the Coast News was published in Sechelt in 1945. The paper moved to Gibsons in 1949. 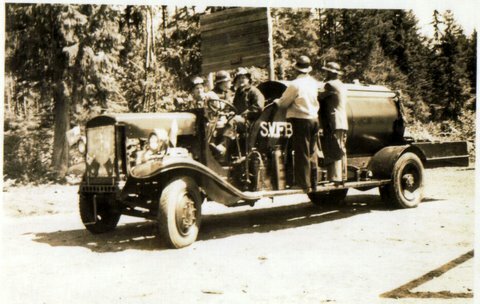 Such were the conditions in Sechelt when Ernie Barker assumed the duties of Chief of the Sechelt-Selma Volunteer Fire Department, and along with about eight volunteers, began the history of organized fire fighting in Sechelt. Forerunners to the department were members of the wartime Sechelt District Civilian Defense Firefighters who were under the direction of William Youngson, Chairman of the Civilian Defense Committee. Fire fighting equipment was pitifully inadequate by today’s standards and it must have been intensely frustrating to have to haul a two wheel hose reel by hand, hook it up to a low pressure standpipe and attempt to contain a fire. Add to that protective clothing consisting of an ARP greatcoat and a steel helmet and one may wonder that the organization was able to attract even one volunteer. Fortunately Sechelt was relatively small in 1945. Ex-Chief Tom Gory estimates there were about 125 people in the Sechelt area at that time “and we knew them all”. Inevitably, the situation improved. The firemen attached a hitch to the hose wagon so that it could be hooked onto any passing vehicle going in the right direction, and by the time Fred Mills took over as Chief in 1949 Reg Jackson had donated a old Leyland chassis on which he mounted a water tank and a Wajax forestry pump. The Leyland was returned to Reg a couple of years later when MacMillan Bloedel donated a used army 4×4 on which the firemen built a water tank. That same year Ernie Pearson secured a used airport fire truck, a 1941 Ford with a front mount pump. During this time Sechelt was slowly shedding the vacation cottage image it had enjoyed as a stop in the Union Steamship itinerary. The school was moved in 1946 from School (Norwestbay) Road to Sechelt where it is still in use. Black Ball ferry service was instituted between Horseshoe Bay and Gibsons in 1951 and in 1952 the Totem lodge, formerly the Selma Park Dance Hall, was destroyed by fire. William G.(Red) McBean died in the fire. In 1952 Cowrie street was paved a year or two later Highway 101 was paved from Sechelt to Gibsons. Harry Billingsley took over as Chief in 1954 and work began on a new Fire Hall on Inlet Avenue. Several residents donated building material and supplies. George Page and a few others beachcombed logs which were milled by Ray Burton and his dad at their mill at Porpoise Bay. Charlie McDermid donated some top quality lumber. Volunteers built the hall. The property on which the hall was built was leased from the village for $1 per year for 25 years. Until this time fire equipment was stored in a shed off Cowrie Street, on the Inlet Street road allowance, adjacent to the lot where the Pharmasave Pharmacy now stands. 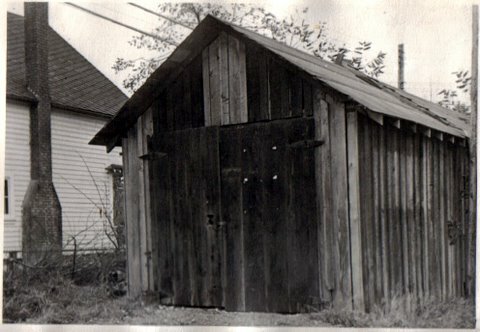 While the new hall was being built, the fire equipment, which had outgrown the capacity of the first hall, was housed temporarily in Hansen’s barn. Tom Parish took over as Chief in 1955, a position he would hold until 1967. As we pass the mid point in the 20th century developments in fire protection kept pace with developments in the Village of Sechelt. The new Fire Hall was completed in 1956. It had space for three trucks and a small meeting room. In 1955 the B.C. Electric superseded the B.C. Power Commission and the next year the first 23 street lights in Sechelt were turned on. In 1955, the Sechelt-Selma Volunteer Fire Department changed its name to the Sechelt Volunteer Fire Brigade and registered as a non-profit society. The new letters patent, issued on February 15, 1955 included the areas around the town of Sechelt. This was done to ensure that fire protection would continue to surrounding areas as most of the firemen lived outside the town boundries. As the brigade advanced, Sechelt followed. On January 21, 1956 a plebiscite was held to determine if the citizens would incorporate as a Village. The vote was 86 to 71 in favour. At that time the population of the village was 400, 245 of them adults. In 1957 the last stretch of highway linking Gibsons to Powell River was completed. In 1958 the Kinsmen obtained an ambulance from Courtenay which they donated to the brigade. Firefighters then became official ambulance attendants and drivers although they had been fulfilling those duties previously using Tom Parish’s old station wagon. St. Mary’s Hospital at that time was located at Garden Bay, some 35 miles distant from Sechelt over a winding, rough, gravel road. The Langdale ferry terminal was opened in 1959. In 1961 the Village recognized the contribution the firefighter volunteers had made to the community by presenting them with the Good Citizens Award. They were invited to the Sechelt Inn for dinner and the presentation. That same year the Black Ball Line was purchased by the B.C. Government, thirteen fire calls and 23 ambulance calls were made, the annual door to door campaign for funds netted $793.90 and Al Campbell started Tyee Airways. Fire destroyed the Sechelt Inn on July 22, 1963, a landmark here for more than 60 years. It was built in 1900 by Alfred Whitaker as a private home. In June 1963, just before the Sechelt Inn fire, Sam MacKenzie moved at a meeting of the department, and Gordie Hall seconded, a motion to authorize the executive to borrow $10,000 toward the purchase of a new fire truck. The loan would be payable over a period of at least five years at an interest rate not to exceed 6%. Since the brigade had little resources and even less guaranteed income, that obstacle was overcome when a number of Sechelt businessmen signified their willingness to back the note. In a press report of the annual meeting that year it stated that receipts totaled $3600 which included grants from the Sechelt Village, the Sechelt Indian Band, the Selma Park Improvement District and $1400 from the annual drive for funds. In 1963 the brigade purchased its first new fire truck, an International 640 gpm pumper built by Hub Fire Engines. That unit is now fully restored and holds a place of honor as the Fire Department’s first “real” fire truck. Walter Waddell died in 1964 after serving the brigade faithfully as secretary for many years. A letter from the auditors, Richard, Crawford & Co. stated the records were in a most commendable state and they were waiving their audit fee of $10. In 1964 St. Mary’s Hospital at Garden Bay Closed and St. Mary’s in Sechelt opened. In 1966 the Sechelt Fire Protection District was formed under the jurisdiction of the Department of Municipal Affairs. A Board of Trustees was elected which included Gordon Hall, Sam MacKenzie, Vic Franske, Jim Janiewick and Chuck Rodway. Under the letters patent, their mandate was to provide Fire Protection to the growing district. This new governing structure had the authority to levy taxes for fire protection purposes and the authority to establish a Fire Department. To this end the Improvement district officially established a Fire Department called the Sechelt Volunteer Fire Brigade. They also assumed responsibility for the financial and administrative affairs of the protection district therefore releasing the firefighters from those responsibilities. The day of the “men in white hats” out collecting money had finally come to an end. In 1967 Tom Parish retired as Chief and was succeeded by Tom Robilliard who held that position until his untimely death in 1975. The Trustees first budget, for 1967 amounted to $12,135 which included a $5,500 loan payment. Since moneys would henceforth come from the citizens through tax levies the Trustees proposed that the Indian Band should contribute proportionately to the costs of running the brigade. An assessment of $8 per house for 60 houses, $25 for the church and $15 for the community hall was suggested. Rates for ambulance calls were also set that year: $10 per call within the district plus $5 for calls over one hour. Remuneration for drivers and attendants: $3 the first hour and then $2.50 per hour. The Trustees and the firefighters moved to discontinue the ambulance service effective April 30, 1968. The ambulance would be used thereafter as a rescue vehicle and would serve as an ambulance only for firefighters. In 1968 the department decided that the old Ford Lehland was beyond repair and recommended the purchase of a 1969 Hub International for $15,000. However, eventually a Chev chassis was bought and a 1000 gallon tank and portable pump mounted on it. This truck served the department for 30 years and was then sold to Savary Island as a back up truck to their main pumper. Also in 1968, Victoria suggested turning the Protection District over to the newly formed Sunshine Coast Regional District. The suggestion was soundly rejected. The Board of Trustees and all firemen confirmed that they wanted to run and be responsible their own affairs even if it meant a lot of hard work. 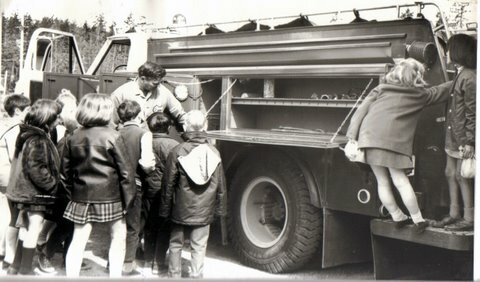 In 1969 the idea of mutual aid was examined in discussions with the Gibsons Fire Department. Also in 1969 we learned that a Fire Department was being planned at Roberts Creek and the Trustees accepted a motion to transfer the old Leyland to them for $1. In 1970 fire destroyed Our Lady of Lourdes church and very nearly cost the lives of several firemen when the structure collapsed during suppression efforts. In 1971 the Chief was authorized to proceed with a Mutual Aid Agreement. Radios would be installed in both fire trucks. The Trustees agreed to pay the firefighters $3 per practice attended. The Union Estates dance pavilion was destroyed by fire. In 1973 a motion to contact architects regarding the design of a new hall was approved, as well as a motion to change the name of the Brigade to the Sechelt Fire Department. In 1974 A Gire Prevention Officer, Donald Pye, was hired at $50 per week and 15c per mile. The Protection District boundaries were extended to include Bayview, Sandy Hook, Tillicum Bay and Tuwanek. It was recommended that the District purchase two lots in downtown Sechelt from Mrs. Crucil for $30,000. The year 1975 began on a sad note when Chief Tom Robilliard died after a short illness. As things turned out it was a busy year. Butch Ono was elected Chief and would serve until 1979. Fire extinguishers would be provided to all Firefighters and Trustees to be carried in their private cars for emergency fire protection. Specifications were drawn for a new pumper truck, designated #3. Tenders for the new truck ranged in price from $46,326 to $59,950. An agreement for the purchase of two building lots for a new Fire Hall and belonging to Mrs. Crucil was completed. The bid from Superior at a cost of $59,950 for #3 was accepted. Sechelt schools were charged a fire protection fee of $10 per classroom. A decision was made to build a 3000 gallon tank at the top of Sandy Hook hill and to apply for a special use permit on that property. 101 Contracting was hired to build a shed for the new truck. Fire destroyed the ‘Flea Pit’, once Sechelt’s Municipal Office (1956-1966) on Sunday, December 7, 1975. At the time of the fire it was known as the Peninsula Drive-in Restaurant. It was also the first quarters of the Bank of Montreal. In 1976 a verbal agreement was reached with the School District for fire protection at a rate of $10 per classroom. A cheque for $380 was received. 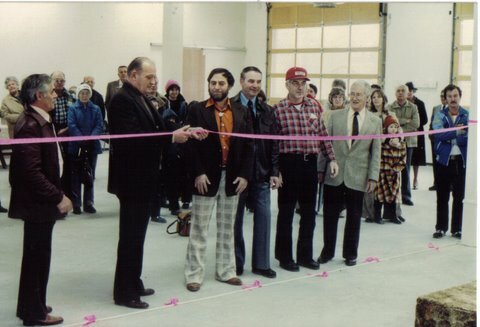 The period 1977 – 1978 was a busy time making plans for the new Fire Hall on Trail Avenue. Tom Gory took over as Chief from 1979 – 1981 and was succeeded in 1982 by Dean Robilliard, and thereafter by Al Robbins in 1983 and by Trevor Johnston in 1984. In 1979 Bill Billingsley was honored at his retirement party after 33 years of service as a Firefighter. In 1981 “The province will provide free Crown Land to the Sechelt Fire Protection District” announced Jim Chabot, Lands Parks and Housing Minister, “at the junction of Sandy Hook Road and E. Porpoise Bay Road”. We still haven’t quite seen that come to be. 1982 was a busy year. Lot clearing for the new hall started in January. The new rescue vehicle, a one ton cube van, was equipped and furbished. The old ambulance was sold for $3,500. For $15,000 Superior would take #3 to Red Deer and replace rusted parts with aluminum. Bids for purchase of the old hall opened. Al Fischers’ offer of $104,000 was accepted and became the new home of Als power plus. Payment was made to the Village for 20% of sale price of land on Inlet property: $13,000. June: bids for hall contract opened, high bid: $555,000, low bid: $254,920 by 101 Contracting. August: rescind motion to send #3 to Red Deer, instead, replace pump and wiring and repair rust spots. September: the District was enlarged to include Snake Bay. Pumps on #1, #2 repaired,. New building accepted in November and the contractor paid. In 1982 there were 75 call outs: 23 chimney, 7 brush, 7 auto, 1 marine, 8 structure, 4 Motor Vehicle Accidents, 25 other. There were two fatalities, one in a structure fire and the second in an MVA. The Firefighters and Trustees occupied themselves during the remainder of the fourth decade in the mundane tasks of weekly training exercises, extinguishing fires, preparing budgets and paying bills. Trevor Johnson was elected Fire Chief in 1985 and 1986. Bob Wing was Chief in 1986 and 1987. A major decision made during his tenure was to proceed with his recommendation to purchase Motorola Paging equipment. His proposed 10 year plan was instrumental in the planning of surveys and equipment purchases for the next few years. Tony Pike served as Fire Chief in 1988 and 1989. Bill Higgs assumed command in 1990. In 1989 a major blaze totally consumed the ‘Dock complex’ At this time the building was a three story, un-sprinklered, wood frame building that housed among other businesses the local Health Unit. Any paper records that were stored there were lost. 1989 was another significant period in the life of the department. An arson fire at the Bank of Montreal building caused an estimated $750,000 damage. A new fire truck that had been authorized for purchase for $138,743, arrived the morning after this blaze. A ‘Jaws of Life’ purchase fund was started by the Canadian Legion with $10,336 raised by April. The ‘Jaws’ were purchased in June 1989 with an amazing total of $27,400. The Sechelt Volunteer Fire Department was selected by the Chamber of Commerce as Good Citizens of the Year, the second time such an honour was bestowed on the department. 16 Survive Air units were purchased for $1750 each. On receipt of the new Survive Air units the old Scott air packs were donated to Pender Harbour Fire Department. In 1990, things really started to get busy, with a local building boom underway and the economy doing well, it was time to recognize that we were not a small town any longer. In 1991 the need for satellite halls was seriously considered. Although the Protection District held property on Fir Road at Davis Bay it was not viewed as a good site for a hall. That property was sold and the funds were then used to purchase a residential property next to the current fire hall. A site on Field Road and another in West Sechelt near the boundaries of the District were thought to be the most satisfactory for quick access to a fire or other incident. For the interim, it was thought that the addition of the rapid response apparatus and a proactive sprinkler bylaw, both completed in 1993 would lessen our response time and the need for expensive satellite Fire Halls. Other significant events in 1991: A new air compressor was purchased at a cost of $23,000. The Mutual Aid Agreement was registered in Victoria as Bylaw #38. A computer was installed and software set up under the direction of Bob Wing, thus moving the department into the electronic age. A command vehicle was ordered for the Chief. At this time the first serious long term plan was formed to address our quickly growing area. In January, 1992, the year Bill Higgs was hired as a full time paid Chief, a significant change was made in the relationship between the Chief and the volunteers. The Chief and Officers now assume the administrative and operational duties of the Fire Department and all other activities are handled by a new organization named the Sechelt Volunteer Firefighters Association. The association has constitution and is registered as a society under the Societies Act. All members of the department, past and present, are eligible for membership in the association which is mostly social in nature. A committee of their members was responsible for organizing the 50th anniversary celebration. The 5-year plan was revised to include the purchase of the Mini Pumper, or Rapid Response Vehicle as it is otherwise known, a new Rescue Equipment Vehicle, an increase in paid staff and a new full sized Pumper. The Mini Pumper was purchased as planned, and has proven to be a worthwhile addition to the firefighting equipment; the state of the art Rescue Vehicle was delivered in the fall of 1995. In 1993 the Department continued its inexorable march onward: A security alarm system was installed. A fleet rate was negotiated for vehicle insurance. A new roof was installed. A fire pole was installed. A Municipal Policy was implemented to require Fire Department approval of all buildings except single family dwellings and duplexes. Firefighters’ pay to be increased to $15 per practice. K.J. Services bid of $25,790 accepted to install sprinkler system in the Fire Hall. The sprinkler system will result in a 15% reduction in insurance premiums on the building. In 1994: The Fire underwriter surveyor noted that our increased fire protection abilities will result in commercial and industrial firms being entitled to lower insurance rates. The Trustees allotted $2000 to the department for hydrant maintenance and blue dot installation. A motion was passed to authorize a bylaw to change the Letters Patent to include the new Sewage Treatment Plant and the Regional District Reservoir. Things really started to heat up in the spring of 1995 with the successful but much contested outcome of the 911 referendum. This allowed the Departments on the coast to move ahead with coast wide paging and an enhanced 911 system. In July 1995 the Department proceeded in bringing on a second full time employee, a Fire Prevention Officer was hired to assist the Fire Chief in his inspection duties. Over the few years previous there had been significant debates over the benefits of residential fire sprinklers vs. the traditional ways of providing fire protection. As the debate continued the Fire Department held fast to its beliefs and refused to approve any new subdivisions in the outlaying areas that were deemed to be too far away from the central Fire Station. The Sechelt Department was one of the few on the frontlines promoting this new way of thinking and to this end produced a video production that was very successful in proving out this point of view. This video, although only produced for local use was eventually distributed around the country by request and remains one of the major tools that the fire service can use to explain to developers and politicians the benefits of fire sprinklers. It was during this time that the District of Sechelt passed their sprinkler bylaw that requires all new residential construction over the size of a duplex to be fully sprinklered. All new public, commercial and industrial buildings are to be sprinklered as well. Not to be outdone, the Sechelt Indian Band was so convinced of this new way of thinking that they passed a law on the Band lands that all new construction would be fully fire sprinklered. Today, we enjoy the benefits of our determination and the courage of our elected leaders, as we are one of the most fully sprinklered communities in Canada! And guess what? We have one of the lowest fire dollar loss per capita as well… go figure….. Notable events in 1995 also include a light plane crash off of the end of the runway at the Sechelt Airport. Three people rescued and all ended Ok. The Sechelt Fire Department celebrates its 50th year of service to the community this year with a weekend of festivities and celebrations. What a milestone! In August a fire in a patients room at Shorncliffe Care Home is suppressed by the activation of a single sprinkler head, saving dozens of lives and millions of dollars of property. The highly anticipated Rescue Truck finally arrives in September of this year and it was more truck than we can even imagine. The truck is still in service today and is working wonders for us. During this time a significant building boom was underway and two issues started to become controversial. One was what to do with land clearing debris? It seems that the newer people moving to the coast didn’t want or appreciate the current practice of the “Open Burning” of this debris. With no real alternative and a lot of pressure to develop land, this issue remains today as one of the all time puzzlers. It appears that the future will see some of this debris hauled to various sites to be processed. However; it was becoming more clear to us that we needed to take a serious look at our structure and what services we should and could provide. To this end a Strategic Planning Committee was struck with representatives from all members and the Board of Trustees. 1995 went out like a lion when in the early morning of Dec 24th a fire broke out in Trail Bay Mall. The fire was caused by a candle left burning and should have resulted in a catastrophic loss to the economic engine of the downtown. However, once again this fire was suppressed by the activation of a single sprinkler head. If anyone needed a reason to endorse this firefighting technology this was it! In 1996, Our very own and long standing Training Officer Chris Caldwell was recognized as the “Training Officer of the year” by the Training Officers Association of BC. In June, Fire Captain Trevor Pike is elected as firefighter of the year by members of the Sechelt Fire Department. In 1997 We launched a Juvenile Fire Setters Program to assist young people who might have a tendency to set fires. The program was a success with three young people benefiting from the program. Also in 1997 the Half-Moon Bay Fire Department commissions a new Fire Safety House that they have constructed over the past three years. All the departments on the coast will be able to benefit from this great public education tool. In February 1998 the Sechelt Fire Department is honored by being chosen “Organization of the Year” by the Sechelt Chamber of Commerce. Over the summer a series of suspicious fires was leaving a trail of damage and frayed nerves around the downtown area. One incident was a vehicle set on fire that was parked in an underground carport. The family sleeping above barely makes out of the house. Another car is set ablaze in September and quick work by the Department saves the home and local RCMP arrest a person of interest in the fires. Although the charges don’t stick, the person moves away and the fires stop, bringing to an end this rash of fires. In November 1998, a high voltage power line comes in contact with a high pressure natural gas line causing an explosion and a flaming tower of gas to erupt from the ground in downtown Sechelt. The Department quickly arrived to protect property, until the gas company could come in and shut off the main gas line. 1999 starts off with a large commercial fire in the downtown core on January 9th. The fire is suspicious and was started in a business known locally as the “Shoppers Express”. It spreads quickly to also consume Kohuch Appliance Centre and for a while threatens to extend into other businesses as well. Three people are seen running from the area and while this fire was being fought a vehicle was set on fire behind the Old Boot Restaurant. In July the Department rescues a man from certain death from within a house on fire in the downtown area. The save was possible because two of the volunteer Firefighters were at the station playing cards when the call came in and they were able to attend without delay in the rapid response Mini Pumper. Way to go guys! In August, we said good by to Old Engine 1. The time had finally come for our 1963 HUB Fire Engine to retire. The old girl holds a warm place in our heart as our first “Real” Fire Truck and served the community well for 35 years. The story is that the members even used their own property as collateral to purchase the truck and paid for it by going door to door and asking for funds. A deal is struck between the First Nations Emergency Services Society and the Sechelt Fire Department that would see the truck return to HUB Fire Engines for a total refit. It would then be used for public education services around the Province. The deal also stipulates that should the truck ever become surplus to their needs, that it would be offered back to the Department in the same spirit that it was given… this would prove to be a very important part of the deal when six years later the truck was offered back to the Department in top notch shape. The Sechelt Volunteer Firefighters Association jumped at the chance to own this unique piece of history and has further improved the truck. It is on display at the Sechelt Fire Hall. By the end of 1999 we had also added on to the Fire Hall with a two story 30ft by 30ft addition. This would allow room for the volunteer members as they had grown to over 30 and the day staff was using space formally occupied by them. A fully equipped gym was also set up on the upper floor. In the year 2000 we were kept busy with several more fires that were deliberately set, causing significant damage. This time two youths were arrested and again the fires stopped. In March the Department entered into an agreement with (HRDC) Human Resources Development Canada, a Federal agency that promotes retraining of displaced workers. The deal was to prepare fire preplans for all of our target hazard buildings. Under the program we hired five people to work for a year doing these plans. The program was a great success and continues today. 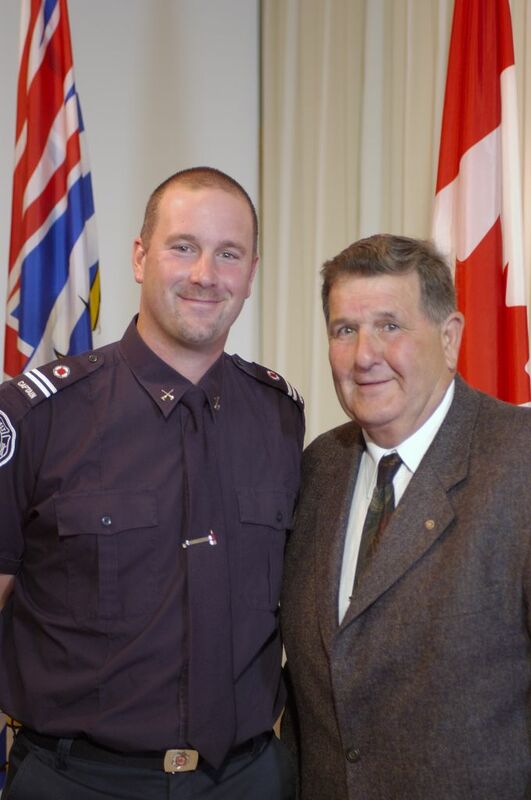 In April the Sechelt Fire Department honors Firefighter Lee Strom as Firefighter of the year. December 22nd a fire destroys a portion of Suncoast Cedar’s Sawmill in Wilson Creek. The Department is able to save a large amount of the mill only because they happened to be close by at another call. What a stroke of luck! March 2001 sees the arrival of our “New engine 1” a year 2000 American La France 1500 gpm Pumper. This is a very high tech machine and will take a lot of training before we can bring it online. In May 2001 Shorncliffe Care Home is nearly lost again as a patient starts his bed on fire with a discarded cigarette. However, once again the fire is suppressed fully by the activation of a single sprinkler head. This is the last straw and smoking by patients is strictly forbidden. Overall in 2001 there was an increased awareness of all the emergency services after the devastating events on Sept 11th. Local artist Terry Barker recognizes the fire service by featuring this Department in one of his popular drawings called “Home of Sechelt’s Heroes”. We feel honored beyond words. Not everyone loves a firefighter as we found out in December when someone stole the car of one of the firefighters that was parked in front of the fire station while he was out at a call. 2002 started off with a tragic fire that claims the life of 71 year old Elsie Campbell at her home in Davis Bay. In March the Fire Department has a formal review done by the Insures Advisory Organization (IAO) and they find that due to the effort over the past years, Sechelt fire insurance rating will be improved to the best that it can be for the size of the Department. In December of 2002 another milestone for the Department as everyone gathers at the Fire Station for a mortgage burning ceremony. Finally we have paid off the loan for the Fire Hall on Trail avenue and we can now start saving for something else. In June of 2003 a cabin is set ablaze in the Wakefield ravine. The fire threatens to extend into the dry forest next to the cabin but firefighters are able to keep it in check. In July a helicopter makes an emergency landing on the Beach in West Sechelt. In August, a forest fire rips through the towns of Lewis Creek and Barrier requiring the evacuation of thousands of people. The Province of BC activates its Emergency Program and takes over the fire fighting effort. Fire Chiefs’ Higgs and Dempster from the Sunshine Coast are sequestered to help out in the Operations Centre in Kamloops. This is just the beginning, as a fire starting in the Okanogan Mountain Park gathers force and eventually devastates the city of Kelowna. Under a Provincial State of Emergency, resources from all over the Province descend on the area in an effort of suppress this giant. The Sunshine Coast is there to help with a fire engine from Gibsons manned by firefighters from various departments heading out. In Sechelt, we sent our Mini Pumper and a three man crew when the first call for help was received. Members rotated on a five day cycle and after over a month on the front line we finally got our guys and truck back home. In August 2003, a fire in the Lion’s Senior Housing Development was completely extinguished by a single sprinkler head saving hundreds of thousands of dollars in property and probably a few lives. 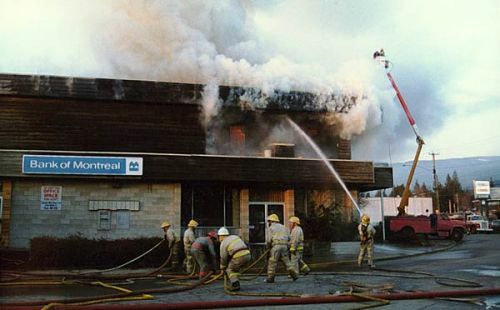 In October 2003 a fire in Teredo Square at the Sunshine Coast Credit Union is also fully extinguished by a single sprinkler head. This is becoming a common theme… with fire sprinklers, fire is out. No fire sprinklers, fire is huge. In December of 2003 the annual fund raising hockey game between the fire department and the RCMP is held with great success. During the game there is a significant car crash that needs a major extrication and then shortly after the members are finished the game a house fire is reported on the Indian Band Lands… what a night! The beginning of 2004 marks another significant milestone in the Department’s history with the hiring of a fulltime Training Officer. Effective January 1, 2004 Trevor Pike assumed responsibility for the development and delivery of the training program within the department. Trevor is a long time volunteer member and the son of Ex Fire Chief and honorary member Tony Pike. April 2004 firefighters are enjoying their Annual Dinner when a report comes in of a house on fire in Davis Bay. Crews are quick to respond and luckily save the structure. A pretty grubby crew arrives back at the party to find most of their wives and girlfriends have gone home…..
October 2004 fire breaks out in B&B Kitchen Concepts. The fire burns up and melts a plastic water pipe on the ceiling. The line bursts and the resulting steam is enough to hold the fire at bay until the Department arrives. Some times we get really lucky. November 2004 fire crews respond to a major blaze at the Specialty Lumber Products Mill on Field Rd. Nothing could be done to save the wood drying kiln that had ignited sending flames into the air that could be seen from West Sechelt. 2005 is the Department’s 60th anniversary. It is also the year that we really started taking advantage of live fire training using acquired structures that have been slated for demolition. In March we accepted the historical Clayton family house for training and by April 6th are ready to raze the 80 year old structure. In May we accepted a large house on Oracle Rd and used it for over a month before finishing it off over a full weekend of training. In July, another resident at Shorncliffe Care Home causes a fire with a cigarette. This time a nurse put of the fire by using a fire extinguisher that she had just been trained to use by the Fire Department. What a success story. In August of 2005 it was decided that the coast radio system was in need of a major upgrade. Plans are developed to also incorporate the new Egmont Fire Department within the SCRD structure and radio system.